My name is Laurie Ratliff, I am 54 years old. While I was born in Texas, my family came back to California where my mother grew up when I was about year old. I grew up in a small town buried in the redwood in the San Francisco Bay Area. 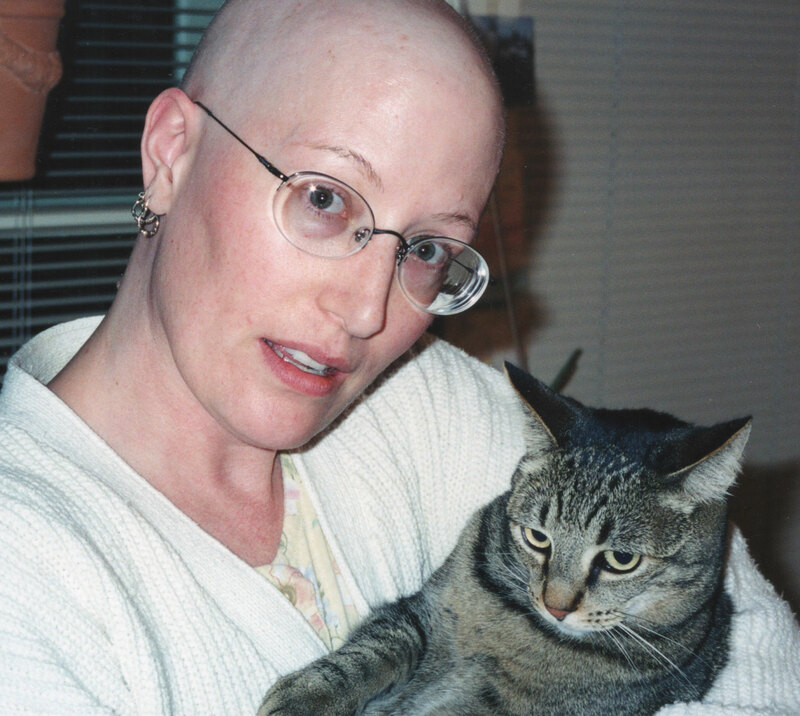 In 1998, at age 34, I was diagnosed with breast cancer that was already metastatic to my bones. My cancer is estrogen/progesterone positive and was very aggressive. Over the course of a year I had a mastectomy, 8 rounds of chemotherapy, a Stem Cell Rescue (aka Autologous Bone Marrow Transplant) and radiation. After that I took Tamoxifen for 5 years and got a monthly infusion of an osteoporosis drug to rebuild my bones and prevent new tumors. Following the Tamoxifen, I’ve been on Femara, an aromatase inhibitor that prevents my body from creating estrogen. After almost 20 years since I was diagnosed I was finally genetically tested and found out I have a BRCA2 mutation. My mother died from breast cancer when she was 53 years old, I was 23. I helped take her to chemo and radiation appointments. The last 3 weeks of her life I moved back in and took care of her so she could remain in her own home. Both my sister and I were with her the night she died. After going through that with her, I was so deeply terrified of getting breast cancer and having to do what she did, I blocked out any thought of it. When the doctor told me I had cancer the words that came out of my mouth were, “I didn’t think it would be this soon.” I suppose handled it okay, I just did what needed to be done. It wasn’t until I found out I was metastatic that I was really afraid for the first time. My 5 year survival odds were still only 25% even if I chose to do aggressive treatment. At one point I thought, in order to have those statistics SOMEONE has to be in that 25% that survive. So until I know I’m not, I will assume I’m in that group. After I finished treatment and was stable for a few years, I had a prophylactic mastectomy and chose to have no reconstruction done. My decision was based on the thought of more surgery, more pain and the reality of all of the possible complications. About 5 years ago I decided to stop wearing any kind of prosthetic breast form and hiding my lack of breasts. It has been a long process (and I’m still working on it), but I love the sense of freedom I gained when I stopped trying to hide my reality. 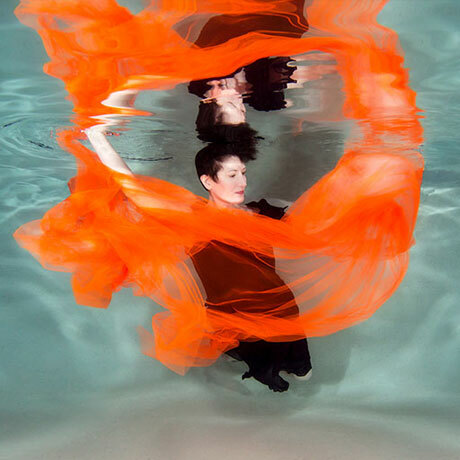 Before I was diagnosed with cancer, I bought a book called Water Dance by Howard Schatz and fell in love with the images of dancing underwater. I always wished I had done something like that when I was younger and in better health, but I had to stop dancing 15 years ago due to chronic pain. Today, my pain is in better control, but my body is older, I’ve lost flexibility, strength, stamina and ability to do so many things I took for granted. Once I passed the heavy milestone of living longer than my mother, I realized I want to do certain things before it really is too late. One of those things has always been underwater pictures. 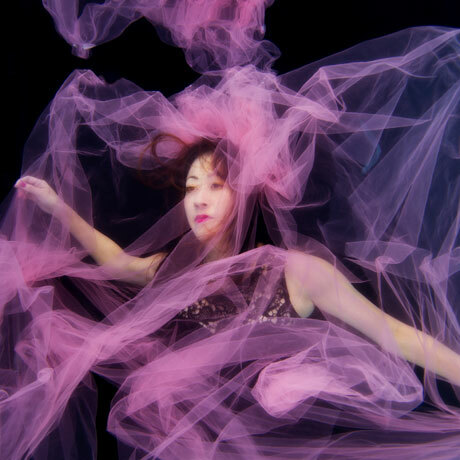 What I wanted to do underwater is have the freedom to be creative in a new way, tell my story and feel like I can dance again. The heated pool made everything more relaxing from the start. 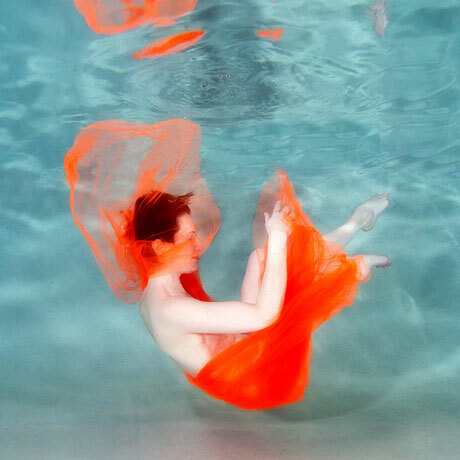 At first it felt strange to step into the water wearing a dress but once I went underwater everything felt very natural. I was more buoyant than I thought I’d be and often felt like I had to work to stay under water. The lighter-than-air mesh fabric Erena brought was surprisingly heavy in the water. It seemed to develop a life of its own and I became preoccupied with it underwater and forgot all of the other things I needed to do. Erena still took amazing photos, even though I felt like I was struggling. When she showed me some of the images, I began to worry less and be more thoughtful about what I was doing. When I was able to relax, I was able to enjoy the weightlessness and silence under the water. Erena was so welcoming and enthusiastic from our very first email that she made the whole process one big adventure. I told her that one of my hopes was to be able to do some pictures without clothes because it was something very much out of my comfort zone. She encouraged me to do it for myself and because it is empowering thing for other women who have had mastectomies to see. I know this is true because several years ago I saw a picture of a woman enjoying a day at the beach with her family. She sat in the surf, her smiling face shaded by a straw hat, wearing only a pair of shorts. Her flat chest with those familiar scars was not hidden nor disguised. That was one of the things that spurred me to work on being more comfortable with how I am now. Doing this photo shoot was a huge step in my journey. I could have easily backed out a number of times, but Erena was supportive and encouraging, so when the time came, I made the choice to conquer my fear. I am still not comfortable seeing myself that way, but I am amazed by the beauty of the pictures she took and proud of myself for choosing to be bold about it. After we were finished I felt many things. I was proud of myself for finally doing something I wanted to do. I was tired in that “good” way when you’ve just had a really fun time. I was relaxed from being supported by the warm water. I was excited by the creativity and eager to do more someday. I was grateful to have found Erena and her amazing empathy. Water has always meant freedom to me. Growing up, it meant school was out for the summer and almost everyday was spent at the local pool playing with friends. It meant being in the ocean and giving in to the push and pull of the waves. It meant the white water of a river and a wild trip in a rubber raft. Now, as an adult, it means the freedom to go somewhere new. A new place to spend a vacation, free from everyday worries. A new place to be creative, free from gravity. A new place in my mind, free from self judgement. I would definitely recommend anyone to experience this. Everyone has different struggles, different fears, different expectations. You can never tell what you might gain from this. That is one of the things that makes working with Erena like going on an adventure in your own backyard. You feel safe and brave at the same time.